The existing b2 line relates directly to the burgeoning market of digital music devices such as I pod and mp3 players. Future development of the line will center on the music and entertainment industries and strive to offer products that enhance these experiences. Now here’s a great device that really lets you make the music your own ^some crazy, f***ed up s*** ^. The mi Jam™ Mixer will have you mixing like a DJ ^terrifying your dullard DJ friends in no time^ and is so portable you can take it anywhere. The Mixer functions with any digital music device, such as iPodÂ® and MP3 player ^a hacked Game Boy or home-built synth circuit^, and can even work with stereo player ^Theremin^ and personal computer ^Commodore 64. 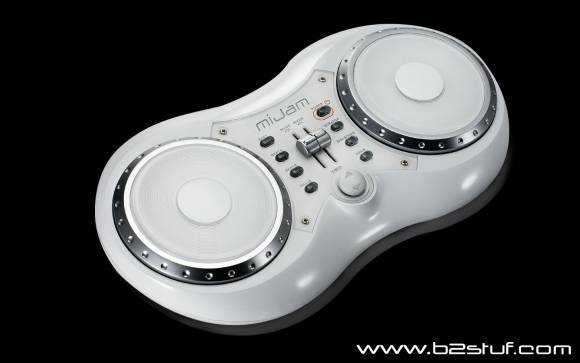 Each mi Jam™ Mixer features two scratch discs which work in both directions with a variety of ^wonderfully cheap-sounding^ effects. Also included in the Mixer are two programmed rhythm selection buttons, digital voice, techno effects, tempo and volume controls ^which you should distort as much as you possibly can^. Just like all other mi Jam™ products the Mixer works either as a standalone Mixer or accompanies your favorite music ^Ableton Live set^ so plug it into your music device ^Max/MSP patch^ and jam away. You can even add the mi Jam™ Stage Mic to add vocals for the complete DJ ^toy-based music^ experience. Yep, I want one. Amazon appears to be out of stock; check your local toy / electronics store. They make a guitar and drum sticks, but the mixer and vocal mic ($20) look like they could do the most damage. But, wait — there’s more. Looking for the mi Jam , I see Sharper Image has gotten into the tabletop / tangible musical interface game, with their own “interactive digital audio sculpture uses movable pawn-like pieces on a base to create original musical compositions accompanied by pulsing light shows.” That’s right: even more circuit-bending fun. Happy holidays, indeed.